Paula Lester has a polo lesson at the Beaufort Polo Club. If racing is the sport of kings, polo must be the game of princes. It has it all: a heady mix of fast and furious competition on the field, as players-many of them hot-blooded Latins-and their beautifully trained, well-bred ponies thunder up and down the pitch, watched from the sidelines by sophisticated, Champagne-sipping, haute couture-clad spectators in some of Britain’s most idyllic parkland settings. Since the game was first played by Persian noblemen, as early as 600bc, when enemies’ decapitated heads were sometimes used instead of a ball, polo has had a certain panache and flamboyant appeal. Originally known as ‘hockey on horse-back’, it was brought here in the 19th century by British cavalry officers. The first match saw the 9th Lancers face the 10th Hussars, who’d been introduced to polo by the Indian army and later refined it into an amateur sport for the aristocracy. With its colonial and military overtones, it’s no wonder many see it as an impenetrable sport that’s difficult to participate in unless you have a trust fund and a stable of ponies. However, this simply isn’t the case anymore. 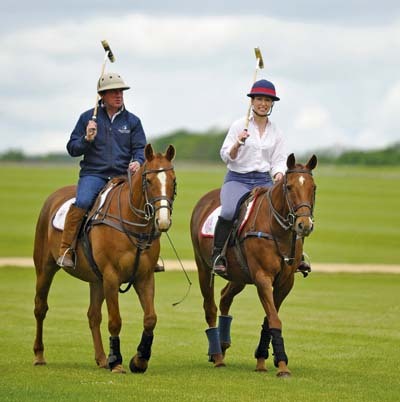 In the past decade, the number of polo clubs in the UK has almost doubled. They’re no longer the preserve of the rich and famous-or professional hired gun: everyone is welcome. ‘It’s accessible and there’s an opportunity to be part of this, even if you’ve never sat on a horse before,’ says Caspar West, polo manager at the Beaufort Polo Club in Gloucestershire. Caspar should know, for, as well as mixing with some of the world’s best exponents of the game and royalty, such as The Prince of Wales (patron of the club) and Princes William and Harry (who often play there), he coaches players of all abilities, ages and backgrounds, including out-of-shape novices like me. ‘How well do you ride?’ asks Caspar with a steady gaze. ‘I’ve ridden since I was small, did Pony Club and went hunting, but it’s been a while,’ I mumble. ‘You’re going to feel it tomorrow,’ he replies with a smile. And, with that, we’re off to practise some stick and ball on the wooden horse. Located alongside Westonbirt Arboretum, the club (first established in 1872 by Capt Frank Henry, a player in that inaugural army match) was revived in 1989 by Claire and Simon Tomlinson, whose sons, Luke and Mark, play for England. Caspar’s pretty useful on the pitch, too-both as a player, with a handicap of two, and as a grade A umpire. It’s also important to maintain a soft grip, which I find practically impossible, as I’m so nervous, and to relax the knees, rather like skiing, so you’re well centred in the saddle and won’t fall off when you hit the ball. ‘Try to keep your feet flattened down and grip with your knees,’ urges Caspar. Once I’ve (sort of) mastered swinging the stick in an entire circle and connecting with the ball, Caspar says it’s time to try it all on horseback. A liver-chestnut pony called Rizzo is led out for me. ‘He’s a high-goal pony,’ says Caspar breezily. ‘Mark [Tomlinson, six goals] has played internationals on him.’ I gulp, but try not to worry as Caspar, 38, has been playing polo for 29 years and is one of the UK’s leading instructors. We begin in the indoor school, where Caspar explains how to hold the double reins in one hand, which is quite alien when you’re used to having a rein in each, yet surprisingly comfortable. I try not to think about the daunting prospect of hitting the ball as well as steering Rizzo and concentrate instead on Caspar’s instructions not to stick my bum out nor to lean forward in the saddle-none of which is simple when your legs are as short as mine and your thigh muscles are starting to burn. Next up, Caspar hands me a stick, wrapping the strap carefully around my thumb and folding my fingers into the correct grip on the handle, and I set off round the school again, trying to replicate the swing I learnt on the wooden horse. At first, I fear I may hit Rizzo’s legs, but soon realise he’s used to this and is not at all fussed by whatever I’m doing on his back. When Caspar is satisfied with my swing, we head outside to the edge of the pitch to have a go at hitting the ball. It’s not as easy as he makes it look. Rizzo obediently trots up to each ball, but I keep missing or lunging as I try to connect with it. We persist and I manage a couple of weak hits, although I know I’d do better if I could relax and swing more freely. As the session draws to a close, Claire arrives and tells me to put more weight on my feet, shifting the stirrups back from my toes to the balls of my feet, in an attempt to improve my balance. She bends her knees and mimes swinging the stick around by pivoting just her hips instead of her entire body. We have another bash and it does get easier, but it’s not until we’ve finished and Caspar asks me to help hit the balls back to the clubhouse that I manage to strike them properly.